When it comes to survival, there is nothing more important than a dependable knife. When it comes to survival, there is nothing more important than a dependable knife. This tool, in my humble opinion, is indispensable. It will cut down branches for a survival shelter, used to cut down branches to make a fire, make traps or skin animals. It can also be used for cooking and defense, if need be. Because of the many uses this survival tool has, I highly recommend having a knife in your bug out bag, your vehicle and anywhere you feel you could be if the SHTF and you aren’t at home. Because so much emphasis is being placed on a knife, you want to ensure that it is of good quality. Many have learned that not all knives are the same and understanding this before investing in one will help you make the most of your investment. I carry a knife with me everywhere I go. If I’m not carrying my multitool, I’m carrying my ESEE. That said, be careful about where you walk into with your everyday carry blade. Once, I went into a museum and had forgotten to take BOTH of these knives out of my bag and the security guards kept scanning my purse and looked suspicious at me. I grew more and more impatient and started asking them what the hold-up was. When asked if I was carrying any weapons, I emphatically denied it because I thought they were removed. Turns out, I had both of them in a secret compartment in my bag. Luckily, they allowed me to go through, but the point is, there are some knife-free zones such as airports, government buildings and some museums, etc., that do not allow knives – so make sure you don’t have them on you when you are near these locations. If you are anything like me, knives are badass. I love them all and am an avid collector. I have bought different types of knives for family members in the hopes that they will also see how awesome knives are. There are so many to choose from and there are times I have to refrain myself from going overboard. That said, I want to emphasize that in a survival situation, having any type of blade on you will be good and perhaps, lifesaving, but there are some that will serve you better than others. These seven tools vary in accordance to their uses and practicality, but have been found to be essentials in a grid down TEOTWAWKI environment. They are all useful in both urban and bush survival, as well as essential to carry in your bug out bags and even your vehicle. 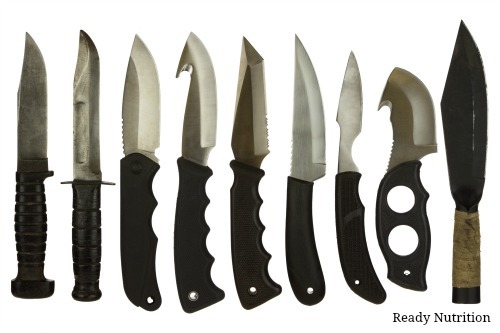 The following are blades you should consider for your preparedness endeavors. Starting with the most basic everyday carry to the tools used for daily living and moving on to tools used for outdoor or primitive survival. Multitool – This is probably the most used of my knife collection. I purchased a Leatherman Wave and use it every time I am camping outdoors, doing my outdoor chores and even to unscrew a broken windshield wiper while traveling (long story). This has many uses, and the blade itself has remained sharp for many years. It is a bit bulky, so I do not carry it in my pocket. Pocket Knife – Pocket knives also deserve high marks as an everyday carry. These handy little knives fit easily in a pocket and can be used for almost anything. I personally love having my pocket knife available to cut boxes and to use it while working outdoors. Living on a ranch, I use it almost daily! 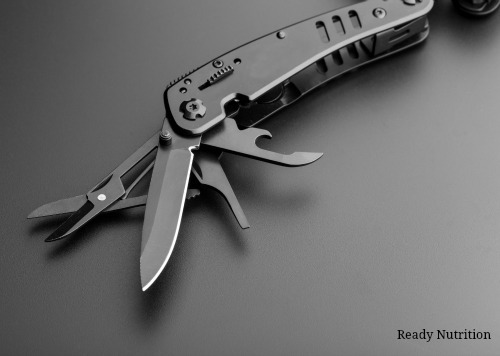 In an outdoor situation, carrying a pocket knife, like a good old fashioned Buck knife can be used to cut small branches to make a fire, to cut away clothing in an emergency situation, used when hunting. Skinning Game Blade – If you are a hunter and want to cleanly remove the hide of a big-game animal, you need a skinning knife. This type of knife is relatively short and has a curved blade to keep the tip from puncturing the hide or spearing the meat. Also, these knives should have a sturdy handle to give you a good grip even in wet conditions. The SwingBlaze is a favorite amongst many hunters. Personally, I have a Ka-Bar Game Hook Knife that works really well too. I have used to clean out animals and because of its small size, it’s great when working inside of a cavity. Hunting Knife – If things go wrong in the outdoors, you want a high quality hunting knife with you. Their usefulness in the field is immeasurable. I hate to break it to all the Rambo die-hard fans out there, but knives with huge blades really have no practical use for hunters. They make pretty good substitutes for hatchets or machetes but aren’t useful for skinning game or other common hunting tasks – so keep the blade between 4-8 inches. Here is a good article on the considerations of a good survival knife. Filet Knife – My grandfather was an avid outdoorsman and fisherman and always had a filet knife around. Filet knives like the Rapala Filet Knife are very useful at filleting fish or removing and trimming fat and silver skin from tenderloin. Axe – Having an axe is paramount in a survival situation and should be one of first investments you make in survival tools. While there are smaller axes that you can take with you while camping or outdoors, you will also want the full size axe at your home to chop wood for fires. Like with all of these knives, you want to ensure that these are high quality. These tools could be a lifesaver if you find yourself in an outdoor emergency situation, so make the necessary investment. As mentioned, having any blade on you is better than none at all in a survival situation. But I also want to emphasize how important it is to know what your knife is capable of. Can it cut cordage? Could you depend on it to assist you in building a shelter? Is it sharp enough to cut branches? The point is: Know your tools and how to use them. As well, keep in mind that if you plan on using your knife or axe outdoors, you want it very, very sharp. Make sure that you have proper knife sharpening supplies on hand. Too bad I can’t see the entire device in the picture. What are you guys smoking? It looks to be a Gerber multi tool. The article is about the blades and tools numbered lower on the page. I believe you, but it would be nice to get a look at the whole tool. Aren’t these guys trying to sell it? Stick with the Leatherman Multi-tool. Seems to be the best quality.